The Abenaki (Abnaki, Abinaki, Alnôbak) are a Native American tribe and First Nation. They are one of the Algonquian-speaking peoples of northeastern North America. The Abenaki live in Quebec and the Maritimes of Canada and in the New England region of the United States, a region called Wabanahkik (“Dawn Land”) in the Eastern Algonquian languages. The Abenaki are one of the five members of the Wabanaki Confederacy. “Abenaki” is a linguistic and geographic grouping; historically there was not a strong central authority. As listed below, there were numerous smaller bands and tribes who shared many cultural traits. They came together as a post-contact community after their original tribes were decimated by colonization, disease, and warfare. The word Abenaki, and its syncope, Abnaki, are both derived from Wabanaki, or Wôbanakiak, meaning “People of the Dawn Land” in the Abenaki language. While the two terms are often confused, the Abenaki are one of several tribes in the Wabanaki Confederacy. Wôbanakiak is derived from wôban (“dawn” or “east”) and aki (“land”) (compare Proto-Algonquian *wa·pan and *axkyi) — the aboriginal name of the area broadly corresponding to New England and the Maritimes. It is sometimes used to refer to all the Algonquian-speaking peoples of the area—Western Abenaki, Eastern Abenaki, Wolastoqiyik–Passamaquoddy, and Mi’kmaq—as a single group. 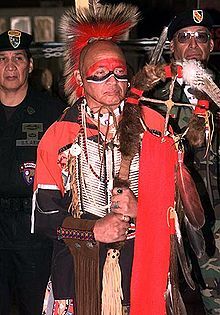 The Abenaki people also call themselves Alnôbak, meaning “Real People” (c.f., Lenape language: Lenapek) and by the autonym Alnanbal, meaning “men”. (also Arrasaguntacook, Ersegontegog, Assagunticook, Anasaguntacook), lived along the St. Francis River in Québec. Principal village: St. Francis (Odanak). The people were referred to as St. Francis River Abenakis, and this term gradually was applied to all Western Abenaki. Cowasuck (also Cohass, Cohasiac, Koasek, Koasek, Coos – “People of the Pines”), lived in the upper Connecticut River Valley. Principal village: Cowass, near Newbury, Vermont. Missiquoi (also Masipskwoik, Mazipskikskoik, Missique, Misiskuoi, Missisco, Missiassik – “People of the Flint”), also known as the Sokoki. They lived in the Missisquoi Valley, from Lake Champlain to the headwaters. Principal village around Swanton, Vermont. 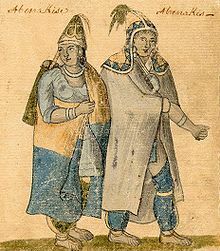 Sokoki (also Sokwaki, Squakheag, Socoquis, Sokoquius, Zooquagese, Soquachjck, Onejagese – “People Who Separated”), lived in the Middle and Upper Connecticut River Valley. Principal villages: Squakheag, Northfield, Massachusetts, and Fort Hill. Winnipesaukee (also Winnibisauga, Wioninebeseck, Winninebesakik – “region of the land around lakes”), lived along the shores of Lake Winnipesaukee, New Hampshire. , lived between the upper Kennebec and Androscoggin rivers in western Maine. (also Kinipekw, Kennebeck, Caniba, later known as Norridgewock), lived in the Kennebec River Valley in northern Maine. Principal village: Norridgewock (Naridgewalk, Neridgewok, Noronjawoke); other villages: Amaseconti (Amesokanti, Anmissoukanti), Kennebec, and Sagadahoc. , lived along the upper Androscoggin River, near Canton, Maine. (also Ouanwinak, Sheepscot, Wawenock, Wawnock, Wewenoc), lived in the coastal areas of southern Maine. The homeland of the Abenaki, which they call Ndakinna (our land), extended across most of northern New England, southern Quebec, and the southern Canadian Maritimes. The Eastern Abenaki population was concentrated in portions of New Brunswick and Maine east of New Hampshire‘s White Mountains. The other major tribe, the Western Abenaki, lived in the Connecticut River valley in Vermont, New Hampshire and Massachusetts. The Missiquoi lived along the eastern shore of Lake Champlain. 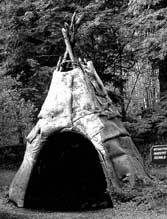 The Pennacook lived along the Merrimack River in southern New Hampshire. The maritime Abenaki lived around the St. Croix and Wolastoq (Saint John River) valleys near the boundary line between Maine and New Brunswick. The name “Abenaki” was derived from the terms w8bAn (light) and Aki (land), which mean “people in the rising sun” or “people of the East”. During the Anglo-French wars, the Abenaki were allies of France, having been displaced from Ndakinna by immigrating English people. An anecdote from this period tells the story of a Maliseet war chief named Nescambuit or , who killed more than 140 enemies of King Louis XIV of France and received the rank of knight. Not all Abenaki natives fought on the side of the French, however; many remained on their native lands in the northern colonies. Much of the trapping was done by the people, and traded to the English colonists for durable goods. These contributions by Native American Abenaki peoples went largely unreported. Two tribal communities formed in Canada, one once known as Saint-Francois-du-lac near Pierreville, Quebec (now called Odanak, Abenaki for “coming home”), and the other near Bécancour (now known as Wôlinak) on the south shore of the Saint Lawrence River, directly across the river from Trois-Rivières. These two Abenaki reserves continue to grow and develop. Since the year 2000, the total Abenaki population (on and off reserve) has doubled to 2,101 members in 2011. Approximately 400 Abenaki reside on these two reserves, which cover a total area of less than 7 square kilometres (2.7 sq mi). The unrecognized majority are off-reserve members, living in various cities and towns across Canada and the United States. In December 2012, Vermont’s Nulhegan Abanaki Tribe created a tribal forest in the town of Barton. This forest was established with assistance from the Vermont Sierra Club and the Vermont Land Trust. It contains a hunting camp and maple sugaring facilities that are administered cooperatively by the Nulhegan. The forest contains 65 acres (26 ha). The Abenaki language is closely related to the Panawahpskek (Penobscot) language. Other neighboring Wabanaki tribes, the Pestomuhkati (Passamaquoddy), Wolastoqiyik (Maliseet), and Mi’kmaq, and other Eastern Algonquian languages share many linguistic similarities. It has come close to extinction as a spoken language. Tribal members are working to revive the Abenaki language at Odanak (means “in the village”), a First Nations Abenaki reserve near Pierreville, Quebec, and throughout New Hampshire, Vermont and New York state. When the Wampanoag people under King Philip (Metacomet) fought the English colonists in New England in 1675 in King Philip’s War, the Abenaki joined the Wampanoag. For three years they fought along the Maine frontier in the First Abenaki War. The Abenaki pushed back the line of white settlement through devastating raids on scattered farmhouses and small villages. The war was settled by a peace treaty in 1678, with the Wampanoag more than decimated and many Native survivors having been sold into slavery in Bermuda. During Queen Anne’s War in 1702, the Abenaki were allied with the French; they raided numerous small English villages in Maine, from Wells to Casco, killing about 300 settlers over ten years. They also occasionally raided into Massachusetts, for instance in Groton and Deerfield in 1704. The raids stopped when the war ended. Some captives were adopted into the Mohawk and Abenaki tribes; older captives were generally ransomed, and the colonies carried on a brisk trade. The Third Abenaki War (1722–25), called Father Rale’s War, erupted when the French Jesuit missionary Sébastien Rale (or Rasles, 1657?-1724) encouraged the Abenaki to halt the spread of Yankee settlements. When the Massachusetts militia tried to seize Rasles, the Abenaki raided the settlements at Brunswick, Arrowsick, and Merry-Meeting Bay. The Massachusetts government then declared war and bloody battles were fought at Norridgewock (1724), where Rasles was killed, and at a daylong battle at the Indian village near present-day Fryeburg, Maine, on the upper Saco River (1725). Peace conferences at Boston and Casco Bay brought an end to the war. After Rale died the Abenaki moved to a settlement on the St. Francis River. The Abenaki from St. Francois continued to raid British settlements in their former homelands along the New England frontier during Father Le Loutre’s War (see Northeast Coast Campaign (1750)) and the French and Indian War. In 2006, the state of Vermont officially recognized the Abenaki as a people, but not a tribe. The state noted that many Abenaki had been assimilated, and only small remnants remained on reservations during and after the French and Indian War, later eugenics projects further decimated the Abenaki people of America through forced sterilization and questionable ‘miscarriages’ at birth. As noted above, facing annihilation, many Abenaki had begun emigrating to Canada, then under French control, around 1669. The Vermont Elnu (Jamaica) and Nulhegan (Brownington) bands’ application for official recognition was recommended and referred to the Vermont General Assembly by the Vermont Commission on Native American Affairs on January 19, 2011, as a result of a process established by the Vermont legislature in 2010. Recognition allows applicants to seek scholarship funds reserved for American Indians and to receive federal “native made” designation for the bands’ arts and crafts. Some people have opposed the bill, as they fear it may lead to Abenaki land claims for property now owned and occupied by European Americans. Others worry that the Abenaki may use recognition as a step toward opening a casino. But, the bill specifically says that “this act shall not be interpreted to provide any Native American or Abenaki person with any other special rights or privileges that the state does not confer on or grant to other state residents.” New Hampshire has considered expanding gambling separate from the Native Americans. There are a dozen variations of the name “Abenaki”, such as Abenaquiois, Abakivis, Quabenakionek, Wabenakies and others. The Abenaki were a farming society that supplemented agriculture with hunting and gathering. Generally the men were the hunters. The women tended the fields and grew the crops. In their fields, they planted the crops in groups of “sisters”. The three sisters were grown together: the stalk of corn supported the beans, and squash or pumpkins provided ground cover and reduced weeds. The men would hunt bears, deer, fish, & birds. Before the Abenaki—except the Pennacook and Mi’kmaq—had contact with the European world, their population may have numbered as many as 40,000. Around 20,000 would have been Eastern Abenaki, another 10,000 would have been Western Abenaki, and the last 10,000 would have been Maritime Abenaki. Early contacts with European fishermen resulted in two major epidemics that affected Abenaki during the 16th century. The first epidemic was an unknown sickness occurring sometime between 1564 and 1570, and the second one was typhus in 1586. Multiple epidemics arrived a decade prior to the English settlement of Massachusetts in 1620, when three separate sicknesses swept across New England and the Canadian Maritimes. Maine was hit very hard during the year of 1617, with a fatality rate of 75%, and the population of the Eastern Abenaki fell to about 5,000. The more isolated Western Abenaki suffered fewer fatalities, losing about half of their original population of 10,000. The Abenaki population continued to decline, but in 1676, they took in thousands of refugees from many southern New England tribes displaced by settlement and King Philip’s War. Because of this, descendants of nearly every southern New England Algonquian tribe can be found among the Abenaki people. A century later, fewer than 1,000 Abenaki remained after the American Revolution. Lydia Maria Child wrote of the Abenaki in her short story, “The Church in the Wilderness” (1828). Several Abenaki characters and much about their 18th-century culture are featured in the Kenneth Roberts novel Arundel (1930). The film Northwest Passage (1940) is based on a novel of the same name by Roberts. The Abenaki are featured in Charles McCarry‘s historical novel Bride of the Wilderness (1988), and James Archibald Houston‘s novel Ghost Fox (1977), both of which are set in the eighteenth century; and in Jodi Picoult‘s Second Glance (2003) and Lone Wolf (2012) novels, set in the contemporary world. Books for younger readers both have historical settings: Joseph Bruchac‘s The Arrow Over the Door (1998) (grades 4–6) is set in 1777; and Beth Kanell’s young adult novel, The Darkness Under the Water (2008), concerns a young Abenaki-French Canadian girl during the time of the , 1931–1936. Accounts of life with the Abenaki can be found in the captivity narratives written by women taken captive by the Abenaki from the early New England settlements: Mary Rowlandson (1682), Hannah Duston (1702); Elizabeth Hanson (1728); Susannah Willard Johnson (1754); and (1792). ^ “Data tables, 2016 census”. Statistics Canada. ^ a b c d e f g h i j Lee Sultzman (July 21, 1997). “Abenaki History”. Archived from the original on 11 April 2010. Retrieved March 20, 2010. ^ a b c d “Abenaki”. U*X*L Encyclopedia of Native American Tribes. 2008. Archived from the original on 2014-06-11 – via HighBeam Research. ^ Snow, Dean R. 1978. “Eastern Abenaki”. In Northeast, ed. Bruce G. Trigger. Vol. 15 of Handbook of North American Indians, ed. William C. Sturtevant. Washington, D.C.: Smithsonian Institution, pg. 137. Cited in Campbell, Lyle (1997). American Indian Languages: The Historical Linguistics of Native America. Oxford: Oxford University Press, pg. 401. Campbell uses the spelling wabánahki. ^ a b c d e “Who We Are”. Abenaki Nation. Archived from the original on 10 February 2010. Retrieved March 22, 2010. ^ “Elnu Abenaki Tribe”. Archived from the original on 26 May 2016. Retrieved 11 May 2016. ^ “Contact Information for Federally Recognized Tribes of New Hampshire, New Hampshire Historical Resources”. www.nh.gov. Retrieved 2018-10-02. ^ “Nulhegan Abenaki attain first tribal forestland in more than 200 years”. VTDigger. 2012-12-18. Retrieved 2018-11-15. ^ Stephen Laurent (2014). “The Abenaki of Vermont”. In Senier, Siobhan. Dawnland Voices. Lincoln: University of Nebraska. pp. 293–296. ISBN 9780803246867. ^ Muir, Diana, Reflections in Bullough’s Pond, University Press of New England. ^ Bourne, Russell (1990). The Red King’s Rebellion, Racial Politics in New England 1675–1678. p. 214. ISBN 0-689-12000-1. ^ “Worlds rejoined”. Cape Cod online. ^ “Administration”. Cbodanak.com. Archived from the original on 2012-07-20. Retrieved 2012-10-30. ^ “Tribal Directory”. U.S. Department of the Interior, Bureau of Indian Affairs. Archived from the original on December 23, 2012. Retrieved December 26, 2012. ^ “Vermont: Eugenics: Compulsory Sterilization in 50 American States”. University of Vermont. Archived from the original on December 28, 2014. Retrieved December 31, 2014. ^ “Vermont Eugenics”. Uvm.edu. 1931-03-31. Archived from the original on 2012-11-01. Retrieved 2012-10-30. ^ Henrik Palmgren. “The Horrifying American Roots of Nazi Eugenics”. Redicecreations.com. Archived from the original on 2012-10-15. Retrieved 2012-10-30. ^ a b “HB 1610-FN – As Amended by the House”. NH General Court. Archived from the original on September 24, 2015. Retrieved March 22, 2010. ^ “The New Hampshire Inter-Tribal Native American Council: Mission Statement”. Archived from the original on July 17, 2011. Retrieved March 22, 2010. ^ “Marriage or Wedding Ceremony”. Cowasuck Band of the Pennacook-Abenaki People. Archived from the original on August 19, 2010. Retrieved March 22, 2010. ^ a b “What We Ate”. Cowasuck Band of the Pennacook-Abenaki People. Archived from the original on July 16, 2011. Retrieved March 22, 2010. ^ “The Consensual Decision-Making Process”. Cowasuck Band of the Pennacook-Abenaki People. Archived from the original on August 8, 2010. Retrieved March 22, 2010. ^ Joe Bruchac. “The Abenaki Perspective on Storytelling”. Abenaki Nation. Archived from the original on 10 February 2010. Retrieved March 22, 2010. ^ “Raccoon and the Waterfall”. Abenaki Nation. Retrieved March 22, 2010. ^ “Joseph Bruchac Biography”. josephbruchac.com. Retrieved 2018-10-11. ^ Johnson, Arthur (2007). “Biography of Indian Joe”. nedoba.org. Ne-Do-Ba (Friends), A Maine Nonprofit Corporation. Retrieved 2018-10-11. ^ Boyd, Janet. “Famous Abenaki – Snow Riders”. www.snow-riders.org. Retrieved 2018-10-11. ^ “Conseil des Abenakis Odanak”. Archived from the original on 2015-04-04. ^ Brooks, Lisa (2008). The Common Pot: The Recovery of Native Space in the Northeast (NED – New ed.). University of Minnesota Press. ISBN 9780816647835. JSTOR 10.5749/j.ctttsd1b. ^ “Alanis Obomsawin: the vision of a native filmmaker”. ^ “Most Rev. Donald E. Pelotte”. Diocese of Gallup. Archived from the original on 2008-05-09. Retrieved 2018-10-11. ^ “Cheryl Savageau’s Poetic Awikhiganak”. ^ “Christine Sioui Wawanoloath” (in French). Terres en vues/Land InSights. Archived from the original on 2016-08-13. ^ Chamberlain, Alexander F. (April 1903). “Algonkian Words in American English: A Study in the Contact of the White Man and the Indian”. The Journal of American Folklore. American Folklore Society. 16 (61): 128–129. doi:10.2307/533199. JSTOR 533199. ^ “Biography of Alexis Wawanoloath”. Dictionnaire des parlementaires du Québec de 1792 à nos jours (in French). National Assembly of Quebec. Joseph Aubery‘s Father Aubery’s French-Abenaki Dictionary (1700), translated into English-Abenaki by Stephen Laurent, and published in hardcover (525 pp.) by Chisholm Bros. Publishing.